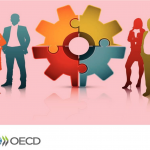 During the last decades, a general trend towards expanding regulations as instruments for governance ran in parallel with the establishment of independent agencies responsible for the regulation of economic and social policy areas. Both the reasons for this expansion (Jordana and Levi-Faur 2004; Héritier and Rhodes 2011) and the specific institutional regulatory model thus devised have been the focus of extensive analyses (Christensen and Lægreid 2006; Jordana et al. 2011). Moreover, scholars have also delved into the many relevant aspects of such a large and global transformation in the tools of government and the intricacies of governance. 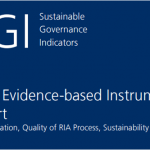 Nevertheless, the consequences of these significant governance innovations – including regulatory instruments and institutions – on accountability issues have remained to a large extent under-researched (some relevant exceptions include Papadopoulos 2003, 2010; Verschuere et al. 2006; Christensen and Lægreid 2011; Føllesdal 2011). This seems rather paradoxical given that accountability has been portrayed as a relevant property that could enhance democratic control and supervision over these new modes of regulatory governance (Majone 1999). This co-edited volume on ‘Accountability and Regulatory Governance. Audiences, Controls and Responsibilities in the Politics of Regulation’, was precisely intended to fill this void and contribute to the study of regulatory governance, today a topic of growing interest across different fields of inquiry and theoretical orientations and of rising political relevance. The book unpacks hence the concept of accountability and explores the challenges of political accountability for the multiple actors and institutions – public and private – increasingly involved in regulatory governance. It does so by first examining the theoretical and empirical dimensions of existing accountability mechanisms in regulatory agencies, through the analysis of their implementation in selected cases and by discussing how accountability challenges democracy. In much contemporary discussion of accountability, a precise definition remains elusive. Furthermore, the term is being used across different disciplines including public administration, political science, law and international relations. To allow for a systematic and comparative assessment of regulatory governance and accountability, the first challenge of this edited volume was to establish an analytical conceptualization of accountability to make the notion more precise, while isolating its normative implications. Building on the various definitions and approaches the literature has discussed, the introductory chapter suggests an analytical framework for the study of accountability in regulatory governance, and provides a common terminology for the development of the theoretical and empirical analyses presented across the chapters. Thus, based on Mark Bovens’ work (2007), we define accountability as any relation between power holders and those directly affected by their decisions. Taken in the context of the regulatory policy field, this relation refers to the interaction between regulatory agencies and regulators on the one hand, and society in general and the more specific fora on the other. Additionally, this first chapter develops a contextual perspective to assess accountability arrangements in the regulatory domain, identifying some basic problems accountability confronts in dealing with regulatory governance to develop a clearer lens through which to view the actual forms of accountability in place. These refer, for instance, to the fact that the accountability of regulatory agencies frequently faces problems of information and interest asymmetry, i.e. between users and consumers, on the one hand, and producers or beneficiaries on the other; all of which, in turn, makes the issue of accountability more complex, especially in a context of agency independence. This theoretical and contextual approach would thus serve as the basis for the different empirical contributions, which provided data and case observations on how agencies’ independence interplays with accountability by examining the concrete mechanisms and measures put in place in regulatory agencies exhaustively and systematically, while cross-examining sectors and countries. In all, the volume offers new insights into the complex and multifaceted concept of accountability and systematically explores three key and interrelated aspects in the area of regulatory governance in democratic settings: the range of accountability mechanisms employed – their measurement and variation – how accountability shapes the policy process and, finally, the impact of regulatory governance on democratic practices. More specifically, contributions to the volume are organized into three parts. The first part of the volume looks into the dimensions and the characteristics of accountability mechanisms implemented in regulatory agencies and provide theoretical arguments and empirical evidence when identifying, and measuring existing mechanisms. Chapters in the second part of the edited volume look into the policy process across sectors and across levels, and in so doing they propose analytical and interpretative frameworks to manage the study of accountability and its institutional context. The third and final section focuses on issues of accountability and democracy while looking into the implications of regulatory accountability for representative and democratic decision-making processes. 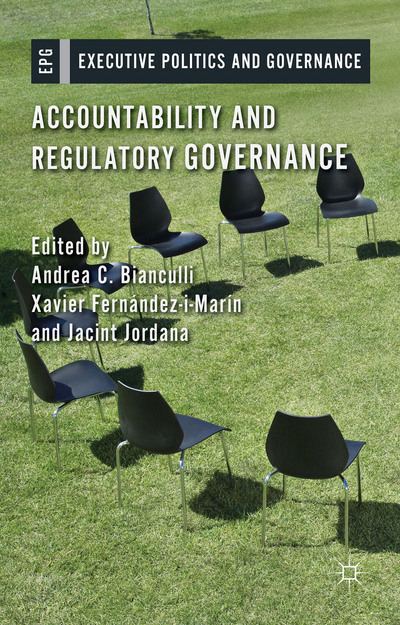 The second chapter, written by the editors of the volume, Xavier Fernández-i-Marín, Jacint Jordana and Andrea C. Bianculli, introduces a large dataset on the institutional characteristics of regulatory agencies, which aims to measure the presence and variety of accountability mechanisms in regulatory agencies in place in the world in 2010. The chapter offers a preliminary analysis of the extent to which upward and downward mechanisms are included in regulatory agencies in different countries and sectors. While it provides the reader with a general perspective on how innovative mechanisms of accountability are extended within regulatory agencies, the authors conclude that in fact, more traditional accountability mechanisms are still largely predominant worldwide. This is followed by an analysis of the relation between accountability mechanisms and agency independence provisions in Chapter 3. Koen Verhoest, Astrid Molenveld and Tom Willems compare thus the various mechanisms in place that are intended to hold agencies, having primarily regulatory tasks across sectors and countries, accountable. Additionally, they investigate the extent to which the presence of such accountability mechanisms is influenced by formal and de facto (self-perceived) autonomy, and study the influence of present accountability arrangements on self-perceived accountability. In Chapter 4, Christel Koop also addresses the question of how to reconcile independence and accountability empirically and comparatively. To this end, she assesses the statutory provisions for accountability that politicians impose on independent regulatory agencies, with a special focus on competition authorities and financial market regulators in 21 established democracies. Even if statutory provisions fail to provide a full picture of accountability, the near-absence of such provisions in some agencies seems to be pointing to accountability deficits. In Chapter 5, Mattia Guidi provides a more theoretical perspective on the links and relations between independence and accountability, and proposes a model according to which bureaucratic autonomy and accountability can be considered as negatively correlated. In other words, there is a trade-off between making an agency independent from political influence and making it accountable. The chapter also illustrates how agencies can take advantage of their autonomy to develop forms of ‘voluntary accountability’ towards social or economic actors. In Chapter 6, Nuria Font looks at regulatory accountability from a European perspective. Based on a dataset covering the overall universe of stable agencies in the European Union (EU), she provides an exhaustive analysis of EU regulatory agencies by measuring formal accountability mechanisms, and by unravelling under what conditions EU legislators are more prone to introduce accountability requirements when establishing the institutional design of agencies. 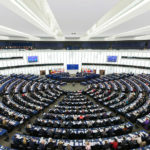 She thus shows that whereas there is considerable variation in formal accountability arrangements, more stringent accountability obligations are found in agency founding regulations when the European Parliament, relying on enhanced legislative powers, is involved in agency design. 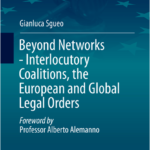 In Chapter 7, based on a comparative assessment of the telecoms regulatory agencies in Italy and Spain, Maria Stella Righettini and Selena Grimaldi explore the techniques and mechanisms devised by these agencies to provide access to information, representation and participation of stakeholders and citizens in the regulatory policymaking process. They assess transparency throughout the regulatory policymaking process, while also evaluating the variations observed in social accountability. In Chapter 8, Işik Özel examines the variation in the institutionalization and implementation of accountability mechanisms in two policy sectors in Turkey: banking and telecommunications. In so doing, she comparatively assesses the de jure designs of these independent regulatory agencies with respect to the de facto operation of accountability, while also exploring decoupled trends in terms of upward and horizontal accountability. In the introductory part of Chapter 9, Colin Scott revisits his article on regulation and accountability (2000), and then moves to a reflection on the transformation of regulatory governance in recent times and the resulting democratic accountability challenges. 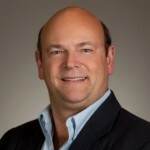 He argues that the globalization of regulatory capitalism has triggered diverse forms of governance, including multiple actors and the design of new experimental techniques. In Chapter 10, Nicholas Dorn provides an insightful and innovative approach to understand financial crises and regulatory accountability. Building on the sociology of financial markets, the author explores to what extent and how the systemic stability of financial markets, the potential for diversity in regulatory regimes, and their democratic direction are connected. Thus, his main contention is that stronger politicization and democratic control over financial regulation is fundamental to assure the sector’s stability. Chapter 11, by Martin Lodge, assesses traditional debates about accountability in the age of the regulatory state and contrasts these traditional debates with the doctrines associated with a ‘consumer sovereignty’ perspective. He explores the possibilities and limitations involved in introducing a consumer sovereignty perspective to the field of regulation, with a particular focus on utility regulation. Finally, Lodge examines how different agencies display features associated with consumer sovereignty-related doctrines. The volume also brings a final chapter by the editors, where they offer some relevant comparative conclusions on the relationship between regulatory governance and accountability. Apart from showing that accountability goes well beyond formal mechanisms as established in regulatory agencies’ statutes, they also underscore the wide set of activities involved in accountability practices. Finally, they highlight the increasing blurring of the distinctions between levels of government and between the public and the private realms, where a growing number of actors demand a role in regulatory governance processes. The book concludes by signalling some future research avenues, including the distinction between formal and informal processes, and the learning dimension attached to accountability, as well as how these dialogic mechanisms affect actors’ preferences and roles through socialization and internalization. Accountability and Regulatory Governance. Audiences, Controls and Responsibilities in the Politics of Regulation, Palgrave, 2015. Andrea C. Bianculli is Research Fellow at the Institut Barcelona d’Estudis Internacionals (IBEI) since October 2013. Her research crosses international and comparative political economy, and lies in the areas of global and regional governance, regulation, trade and development, with a focus on the Americas. Jacint Jordana (Granollers, 1962) is professor of Political Science and Public Administration at the Universitat Pompeu Fabra. He has a PhD in Economics (Universitat de Barcelona, 1992). Xavier Fernández-i-Marín is a Senior Researcher at ESADE Business and Law School. He is also associate professor at the Department of Political and Social Sciences of the Universitat Pompeu Fabra, Barcelona. Bovens, M. (2007) Analysing and Assessing Accountability: A Conceptual Framework. European Law Journal, 13, 447–468. Christensen, T. and Lægreid, P. (2011) Democracy and Administrative Policy: Contrasting Elements of New Public Management (NPM) and post-NPM. European Political Science Review, 3, 125–146. Føllesdal, A. (2011) The Legitimacy Challenges for New Modes of Governance: Trustworthy Responsiveness. Government and Opposition, 46, 81–100. Héritier, A. and Rhodes, M. (eds) (2011) New Modes of Governance in Europe. Governing in the Shadow of Hierarchy (Houndmills: Palgrave Macmillan). Jordana, J. and Levi-Faur, D. (eds) (2004) The Politics of Regulation (Cheltenhan: Edward Elgar Publishing). Jordana, J., Levi-Faur, D. and Fernández-i-Marín, X. (2011) Global Diffusion of Regulatory Agencies: Channels of Transfer and Stages of Diffusion. Comparative Political Studies, 44, 1343–1369. Majone, G. (1999) The Regulatory State and its Legitimacy Problems. West European Politics, 22, 1–24. Papadopoulos, Y. (2003) Cooperative Forms of Governance: Problems of Democratic Accountability in Complex Environments. European Journal of Political Research, 42, 473–501. Papadopoulos, Y. (2010) Accountability and Multi-level Governance: More Accountability, Less Democracy? West European Politics, 33, 1030–1049. Verschuere, B., Verhoest, K., Meyers, F. and Peters, G. B. (2006) ‘Accountability and Accountability Arrangements in Public Agencies’ in T. Christensen (ed.) Autonomy and Regulation (Cheltenham: Edward Elgar Publishing), pp. 268–298.